Synopsis: In the summer of 1983 precocious 17-year-old Elio Perlman is spending the days with his family at their 17th-century villa in Lombardy, Italy. He soon meets Oliver, a handsome doctoral student who’s working as an intern for Elio’s father. Amid the sun-drenched splendour of their surroundings, Elio and Oliver discover the heady beauty of awakening desire over the course of a summer that will alter their lives forever. This completely mesmerising and achingly beautiful coming-of-age love story from Luca Guadagnino [The Protagonists (1999), I am Love (2009), A Bigger Splash (2017)] has a sensitive script from acclaimed director/writer/producer James Ivory, adapted from a 2007 Andre Aciman novel. The sumptuous cinematography of Sayombhu Mukdeeprom creates the lazy, hazy days of summer in northern Italian locations around Cremona, Bergamo and Sirmione. Here Elio Perlman [Timothée Chalamet – Interstellar (2014), Homeland (TV 2012)], an intellectually precocious 17-year-old American-Italian boy spends his days in his family’s 17th century villa transcribing and playing classical music, reading, and flirting with his friend Marzia (Esther Garrel). Elio enjoys a close relationship with his father [Michael Stuhlbarg – A Serious Man (2009), Trumbo (2015), Arrival (2016)] an eminent professor specializing in Greco-Roman culture, and his mother Annella (Amira Casar), a translator; this pair favour Elio with the fruits of high culture in a setting that overflows with natural delights. 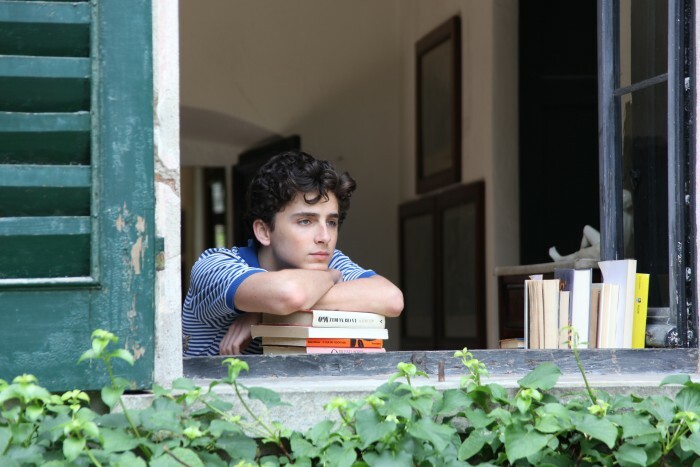 While Elio’s sophistication and intellectual gifts suggest he is already a fully-fledged adult, there is much that yet remains innocent and unformed about him, particularly about matters of the heart. One day, Oliver [Armie Hammer – Nocturnal Animals (2016), The Man from U.N.C.L.E (2015)], a charming American scholar working on his doctorate, arrives as the annual summer intern tasked with helping Elio’s father. Amid the sun-drenched bliss of the setting, Elio and Oliver discover the heady beauty of awakening desire over the course of a summer that will alter their lives forever. Stand out performances come from the entire ensemble, with a particularly breath-taking turn from Michael Stuhlbarg, who delivers a moving monologue that provides wisdom, comfort, compassion and acceptance to his young son. Call Me by Your Name is a deep love story – like Blue is the Warmest Colour [d. Abdellatif Kechiche (2013)] – which transcends gender and sexual orientation. Destined to be an awards contender, with an outstanding soundtrack from Sufjan Stevens and The Psychedelic Furs, this is an unmissable masterpiece of a film.